California's coastline is 1,100 miles long. California not only has an extensive coastline, but about 7,740 square miles (5% of the state) are covered in water. Major rivers include the Sacramento River, San Joaquin River, and the Colorado River. Major lakes include Lake Tahoe, the Salton Sea, Owens Lake, and Searles Lake. The state's marine and inland waters have been an important resource for food and transportation from ancient times until the present. What is California's maritime history? California's maritime history has been shaped to a large degree by commerce. Indigenous watercraft were used to collect marine resources and a well developed maritime economy existed by about 5,500 years ago. As early as 1542, European explorers traversed the coast looking for the fabled Northwest Passage. Spanish settlers followed the explorers and established settlements to provision and repair Spain's fleet of Manila galleons. Later, the fur and timber traders, whalers and other businesses shipped their products by sea up and down the coast, and hundreds of thousands of people came to California by steamship after the discovery of gold at Sutter's Mill in 1848. Freighters, fishing boats, passenger ships, and battleships, among others, continue to ply California's waters. A connector rod from the Paloma site. Many vessels had the misfortune to wreck or sink and now form the extensive shipwreck graveyards in California's coastal and inland waters. There are thousands of wrecks of many types and descriptions. 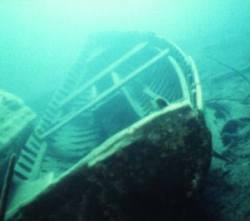 The earliest recorded wreck occurred in 1595 when the Acapulco-bound Manila galleon San Agustin sank near Point Reyes. From steamships to World War II naval aircraft, California waters hold a wealth of maritime history. 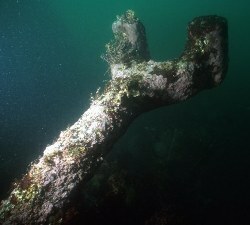 A few later examples of the state's diverse historic underwater sites include the Baltimore-built clipper Frolic wrecked near Point Cabrillo in 1850, the steamship SS Pomona that sank in Fort Ross Cove in 1908, the freighter Norlina wrecked near Salt Point in 1926, the British freighter Pacific Enterprise lost near Point Arena in 1949, and a World War II Navy Corsair fighter plane ditched by its pilot in Crystal Cove in 1949.
Who takes care of California's underwater archeological sites? California claims title to all abandoned shipwrecks and resources that lie in state waters. The Department of Parks and Recreation employs a full-time State Underwater Archaeologist who manages all cultural resources located in state underwater parks and preserves. The State Lands Commission and the Office of Historic Preservation work together when someone wants to study, excavate, or search for a shipwreck, which requires a permit. The Office of Historic Preservation reviews the permit applications and makes recommendations on site preservation and protection. If the application is satisfactory, the State Lands Commission issues the permit. 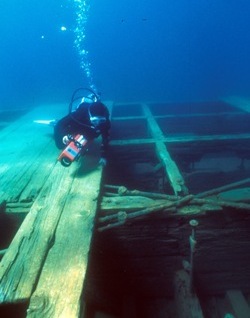 One of the sunken, historic dories at Emerald Bay. allow exploration and sometimes excavation with small hand tools. allow searches for vessels with electronic equipment and are issued to individuals or organizations representing museums, universities, colleges, or other recognized scientific or educational institutions and individuals or organizations with the capability to conduct the activities. To apply for either permit, contact the State Lands Commission. Are there any underwater parks in California? California created the country's first underwater park, the Point Lobos State Reserve in 1960. Since then, the number of underwater parks has grown to include almost two dozen areas and more are proposed. Most of these parks stretch along the state's coastline, with the exception of Mono Lake, D.L. Bliss, Emerald Bay-Lake Tahoe and Lake Perris which are inland preserves. What laws are there about underwater archeology in California? The relevant statutes are codified at California Public Resources Code �� 6301, et seq., and the regulations are at California Code of Regulations Title 2 �� 2002, et seq. and 14 �� 929, et seq. These laws declare that California's archeological resources are endangered by development, increased population, and natural forces and that preservation of these resources is important to illuminate and increase public knowledge of the state's historic and prehistoric past.